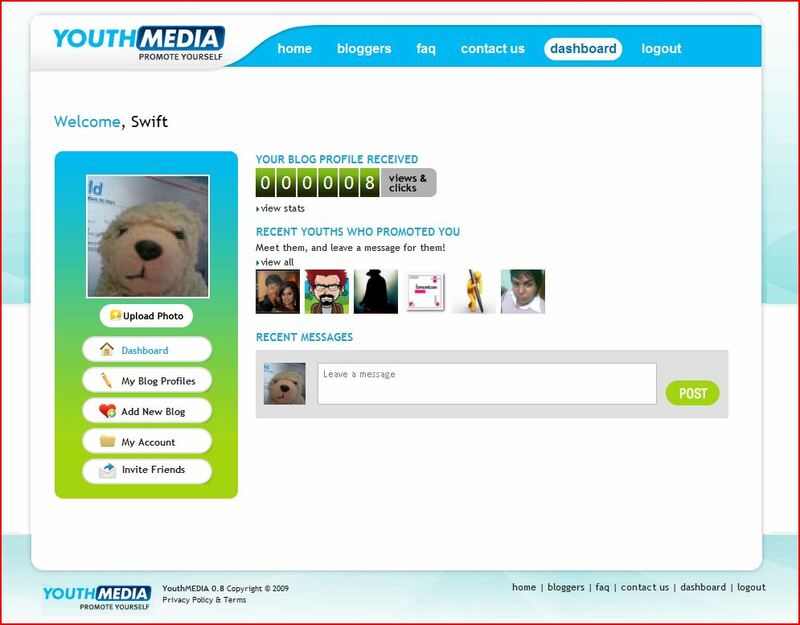 YouthMEDIA is yet another blog promotion network. 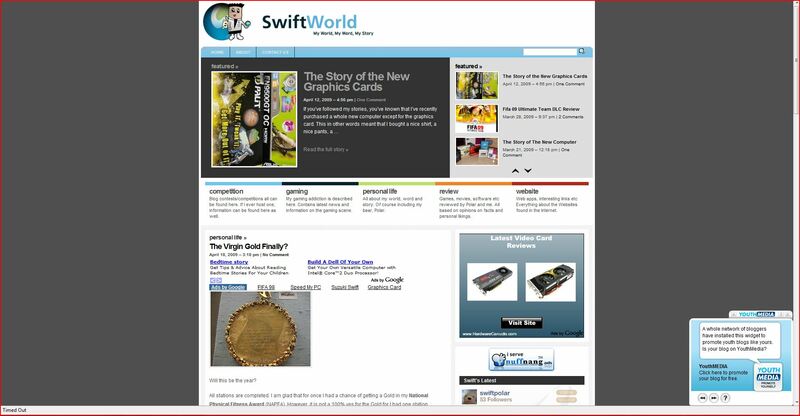 Its purpose is roughly the same as of the ever popular EntreCard; to promote your site at others site. Instead of using credits etc to buy spaces on people’s site, YouthMEDIA allows webmasters to simply show their website randomly on other users’ site. Basically it is like a two way traffic whereby you have to show other people’s website in order for them to show yours. This is ordinary and nothing so special but what actually makes me dedicate this featured post for this service is mainly because of the local audience. I’ve been seeing more and more local start-ups catering to international (but of course having a bigger local member base) audience as well as that of the locals. When I say local I am referring to the neighbouring countries Malaysia, Singapore, Taiwan etc (somewhere in that region). We’ve already seen a local based blogging network BloggerUnited and now we have a local based blog promotion network. Pretty neat I would say for I’m kind of attracted to things and services that are closer to my homeland. It gives that homely feeling that other big multinational sites doesn’t. I’ve always thought that aiming a different target audience and providing a similar service would thrive for people would not mind having to mix around with people in their own area. For example if we were to make a search engine, we would be competing with the big “G” (Google). However, if we were to make a search engine that caters mostly to people in our own country, it might attract locals to come to use it. For example the Singapore Press Holding’s (SPH) RedNano.sg. Anyways, take a look at the bottom right-hand corner of your web browser. You would see a YouthMEDIA pop-up that have some information and a picture accompanying it. That’s basically the widget for the service. At your site, you’ll be displaying other random people’s website and in return, yours would be displayed on theirs as well. That is basically all that they provide for now. Other features such as displaying advertisements would be available later on which would provide additional income for the webmaster. Talking about specific, YouthMEDIA isn’t really trying to get just a local audience but instead, they’re aiming for a targeted age group of bloggers and webmasters. It states that it is a blog promotion network for all bloggers aged 15 to 35. Their purpose is to broadcast the voice of young bloggers everywhere. Well, that sounds like what I need! I am young and I want to have my opinions and voice broadcasted out for the whole world to hear! Woohoo! One main problem though; I ain’t liking how the widget is displayed at my bottom right and how it is movable. I would prefer that it stays in a fixed position rather than following the reader’s scrolling. Kind of distracting at times and how it just opens by default makes it look rather corny. It looks like all those money making websites whereby you can click there for promotion or whatever. If it isn’t going to be staying put at a fixed position, at least let it be closed by default. Looks much better in my opinion. Anyways that is about all I can say about the service. I’ll do a follow on in future when it is nearer to completion.